1954 – 1987 Returned to the college to work as a lecturer. 1937 Fraeta Group’s exhibition, at the office of the Association for Intellectual and Moral of Vietnamese. 1942 Participated in the group exhibition in Japan. 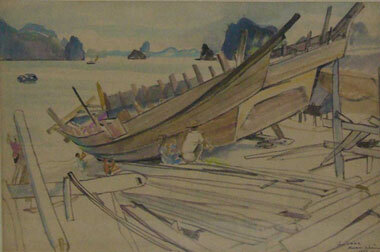 Most of his paintings about Japanese landscapes and women was appreciated very high. His paintings were displayed in Vietnamese fine arts museum, in Paris, New York, Tokyo’s museums and in many private collections.